Toscha Seidel was a Russian (Ukrainian) violinist and teacher born on November 17, 1899 (Stravinsky was 17 years old.) He is remembered for his work in Hollywood studios. He began his studies in Russia at age 7. At age 9, he was already studying in Berlin at the Stern Conservatory. In 1912, he became a pupil of Leopold Auer at the St Petersburg Conservatory, together with Heifetz, Zimbalist, Milstein, and Elman (among others.) 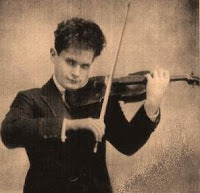 As a teenager, he gave several joint recitals with Heifetz. Among his many highly praised solo recitals was one that took place in New York on September 19, 1920. He concertized in Europe and elsewhere for about fifteen years before coming to permanently live in the U.S. in the early 1930s. Soon, as so many other classical musicians of the time did also, he made his way to the motion picture studios in Hollywood where he served as concertmaster of the Paramount Studios orchestra. It is documented that in 1934 he gave Albert Einstein one or more private violin lessons. Einstein paid him by giving him a diagram of a formula which was tied to his Theory of Relativity - Einstein had a good sense of humor. Later on, they gave a joint recital to raise funds for some philanthropic effort. Seidel also loved to play chess, as did Oistrakh, Kogan, Menuhin, Elman, Kreisler, and so many other violinists. His violins were a Guadagnini of 1786 and the Da Vinci Stradivarius (1725.) Seidel ended his days as a pit orchestra violinist in Las Vegas. Many refer to his later years as tragic but nobody will say what the tragedy was. He died in Los Angeles on November 15, 1962, at age 63.
rip, one of the great artists of history.